Diseases caused by fungi have become a significant medical problem and are increasing at an alarming rate. The number of fungal species reported to cause disease is greater than ever some of these species had previously been considered harmless. 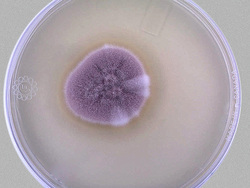 The increase in the number of patients that are not immuno-competent, along with greater awareness and appreciation of opportunistic fungal infections, have highlighted the importance of accurate identification of fungi. This full-color handbook makes it possible to identify medically important fungi with ease and confidence. Whether the specimen is a common or unusual fungi, the authors take the mystery and difficulty out of identification. A greatly expanded, completely revised and updated edition based upon the highly acclaimed first edition (Identifying Filamentous Fungi). Now including more fungi, including yeasts, new tables, more color photographs, an expanded glossary, more descriptions. Includes two keys: a unique color-coded key --you match the colors to those on colony surface, and a comprehensive dichotomous key. Additionally, accurate color photographs of each colony are provided along with precise photomicrographs and drawings to guide your own microscopic observations. The format of the book is designed to facilitate accurate, easier identification. The authors provide careful explanations of fungal identification techniques, stains, and media; useful for experienced laboratory personnel and scientists but also invaluable for those learning medical mycology. No other book has such extensive color photography and these unique identification keys. 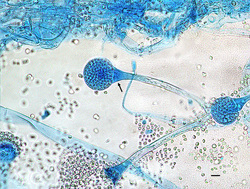 "The identification of fungi depends mainly on the morphological examination of microscopic structures, particularly the spores and the conidia, as well as the specialized cells that produce them." Here are a few examples of the photographs that enhance your ease of identifying fungi. 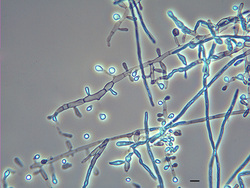 This is an example of one of the many photomicrographs that illustrate -- and help you identify these medically significant fungi.